Light & airy - this knit afghan and hat will make you want to snuggle up with your baby! Made with RED HEART® "Light & Lofty™" or Red Heart® Baby Clouds™. 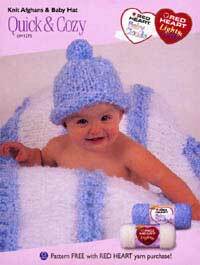 Directions are given for baby blanket; changes for regular and large size afghans are in parentheses. Afghans measure approximately 34½ x 40 (48½ x 65, 63½ x 80)". Hat circumference = 15" to fit most babies. RED HEART® Bulky Weight Yarn: RED HEART® "Light & Lofty™" yarn, 100% acrylic, Art. E708 (6 oz skeins) or RED HEART® "Baby Clouds™" yarn, 100% acrylic, Art. E710 (6 oz skeins). Afghan Amounts: 6 (16, 22) Ounces No. 9025 Blue Sky CA, and 12 (26, 42) Ounces No. 9311 Cloud CB. Hat Amount: 2 Ounces CA. Circular Knitting Needles: U.S. Size 15 [10mm] - 36" for afghans. Knitting Needles: U.S. Size 15 [10mm] for hat. With CA cast on 69 (97, 127) sts. Row 7: Purl. ** Cut CA. Join CB . Now work 15 rows (5") in Stockinette stitch with CB, begin Purl row, end Purl row. With CA cast on 31 sts. Work in Stockinette stitch for 8", end P row. Next Row: * P2tog; rep from * across - 8 sts. Cut yarn leaving a long end for sewing. Weave yarn through remaining sts, draw up tightly and fasten securely. Sew back seam. Make a 2" pom pom and attach to top of hat.